I’m lucky enough to have a job that allows me to get up and just disappear when things get tough. I don’t vanish for hours and hours and I certainly don’t hide to have a nap. Sometimes it only takes five or ten minutes away from it all to get my head together and get back on track. Somehow I discovered just the place to make this all happen and for a long time I didn’t understand why it worked for me. Just outside the back door of the building where I work, there is a little grassy patch that has been invaded by clover. It’s not a glamorous place. It’s probably about a three feet by three feet patch of grass between the sidewalk and the building that overlooks a parking lot. The electrical meter hangs on the brick wall just above it but that particular area is not viewable from any window in the building and even though the roar of the traffic from a busy highway is undeniable, it’s still very tranquil for me. Now and then, like today, I’ll take a walk to my secret spot, kick off my Pay-Less shoes and sink my toes into that bed of clover. It just does something to me. I can’t explain it. Just a few minutes of tromping through clover and breathing in and out settles my nerves and helps me get focused. I didn’t know why it worked, but it did. So, when things got rough, I would just go out there and hold my little ritual without questioning it. Then a few months ago, a childhood friend sent this picture to me and it all made sense. She and I had grown up next door to one another and with her parents still living in the same place, it was convenient for her to buy the house I grew up in. 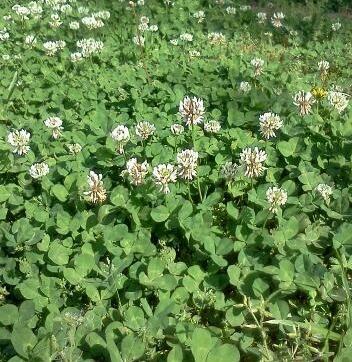 She sent this picture of the clover that grows in what is now her front yard. It’s the same patch that she and I sat in as children and just did all those kid things that you do on long, lazy summer days. Funny how you don’t consciously remember things like that but your mind and body never forget. The weather is beginning to cool and soon it will be too cold to expose my toes to the elements. Now, instead of having to cope with the day to day grind without my clover, I’ll just set this picture as my PC wallpaper and remember those days so many years ago with my friend when neither of us had a care in the world.